at the moment, probably the make noise mult, ears, one of the just friends, and mangrove. Zadar I have pre-ordered with more of a try-it-out-and-see approach- I try to limit the screens as much as possible but we’ll see how that goes and if it has the power/flexibility to oust a JF for modulation and/or envelope purposes. QPAS I’m pretty thoroughly convinced has staying power in the case, potentally replacing sisters just because of the small case, we’ll see, but for now I’m thinking of keeping sisters in to experiment with how the two play along. I’d say the same about Morphagene vs W/, though that’s maybe even a little bit more apples to oranges. I love how instant and immediate the Morphagene is compared to w/, but man it is big, expensive, and the auto-leveling kind of drives me crazy…what I wouldn’t give for just a little minipot level control over the input gain, rather than the auto-leveling implementation that for me always seems to result in either inescapable clipping or TONS of noise. W/ I need more time with (ha jokes), it’s so insanely powerful and sounds great but I swear it would be a no brainer slam dunk if it were just 4-6 hp instead of 2 and had a knob or something on it to cut back on the button combinations. 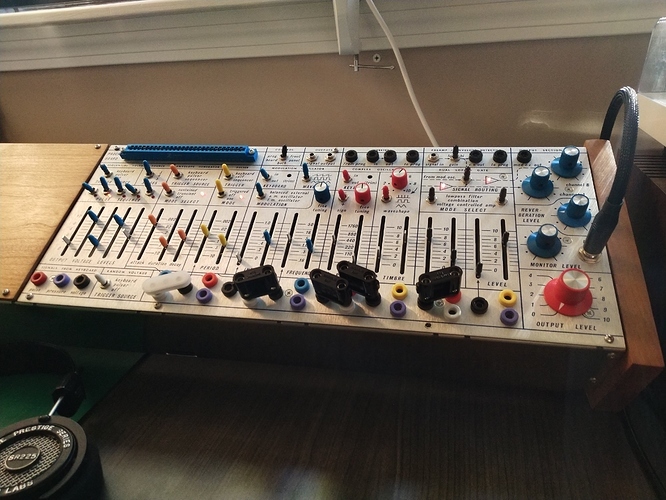 if using one JF as a sound source and one as a modulator then I say go for it, but two as modulators or two as a sound source I think would be a bit much in 104hp depending on what else is there. 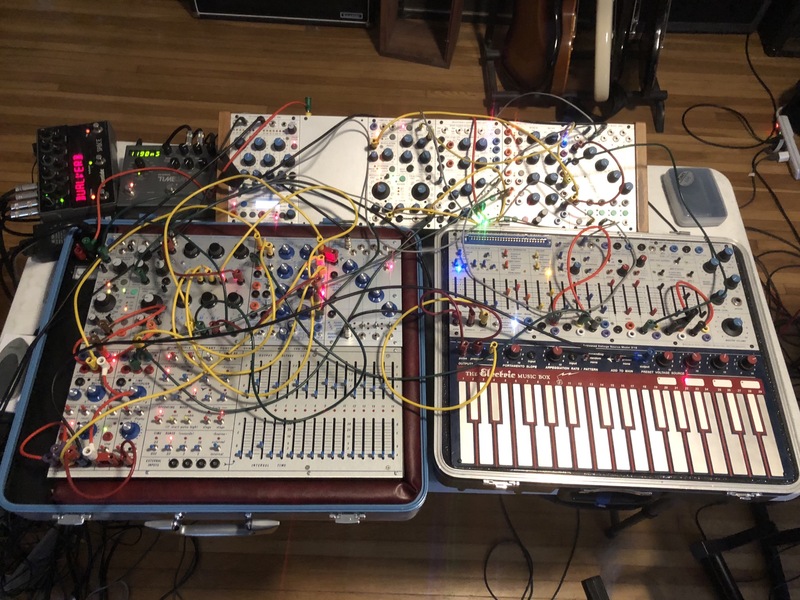 Buchla setup ready for a show tomorrow evening! Sure thing! The left case is a Sputnik 25S Dual Oscillator (a 259 clone in one space), a 257r Voltage Processor, a 281r Quad Envelope Generator, and a 292c Quad Lo Pass Gate and 248r Multiple Arbitrary Function Generator (a really great sequencer that can do a large number of things). The skiff is all 200e stuff: 206e preset manager and mixer, 261e Dual Oscillator, 267e Uncertainly Source/Dual Filter, 281e and 292e. Very nice! I’m building a somewhat similar box. What power supply are you using? CV bus case came today- feels really nice. Sadly I didn’t realize it needs M2.5 screws and all I have are M3 and there aren’t any brick and mortar stores near me who sell them, so loosey goosey patching for a couple days! still shuffling the modules around (Mangrove currently for sale), looking at add an Erbe-Verb, not sure after that. I’ve decided to go in the direction of basically a make noise shared system with a few twists, so settled on the DPO. I do love the mangroves but at the moment I can’t afford to keep everything around, just looking to hone in on a focused system. 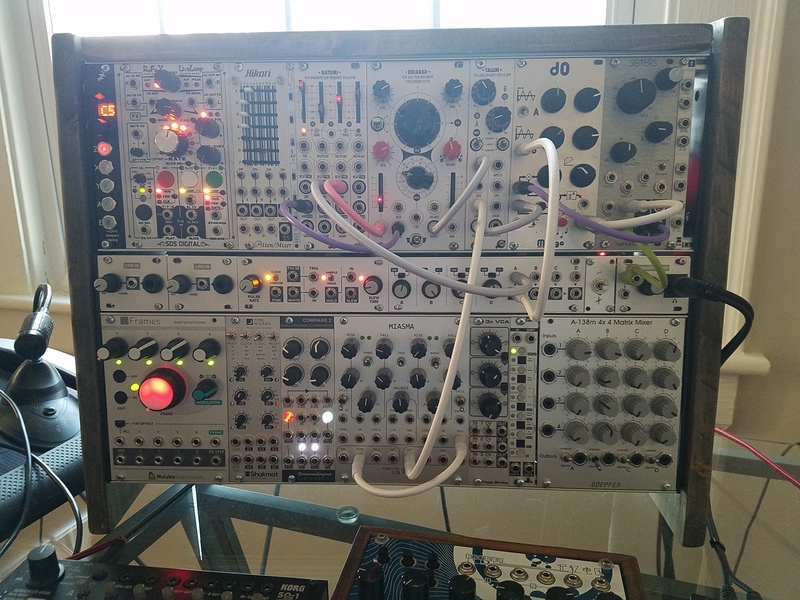 Here is my current modular setup. I began with a Make Noise shared system and gradually expanded. After downsizing due to redundancy this is the state I’m in, and I have to tell you I’m more in love with this thing that I ever was before. If you look through this thread you’ll see that this has changed quite a few times, but always towards getting smaller. 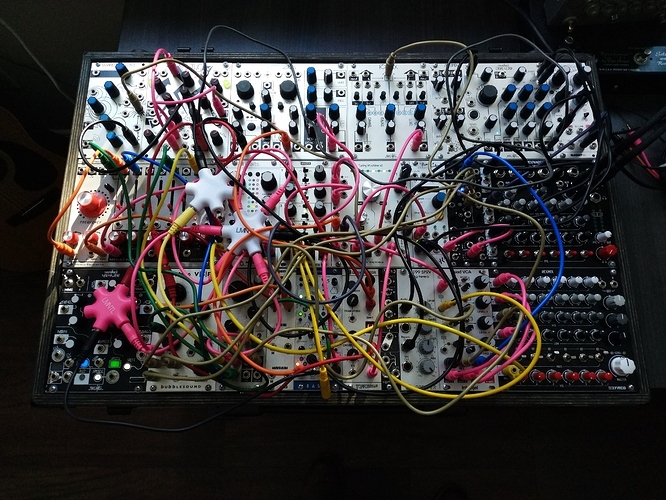 What my personal journey in the modular world has taught me is that working with less is more. I don’t mean that in the traditional sense either. 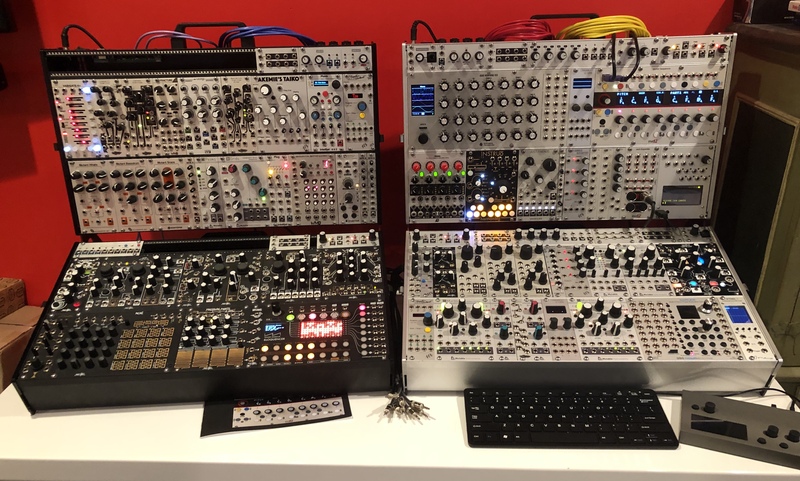 I mean that by utilizing modules with lots of functionality one can have more with less while still benefitting from all that modular has to offer. With this particular setup I believe all things sonically are possible. And because of the way it is setup it will just continue grow like a sponge. My next picture in here should include some monome stuff. 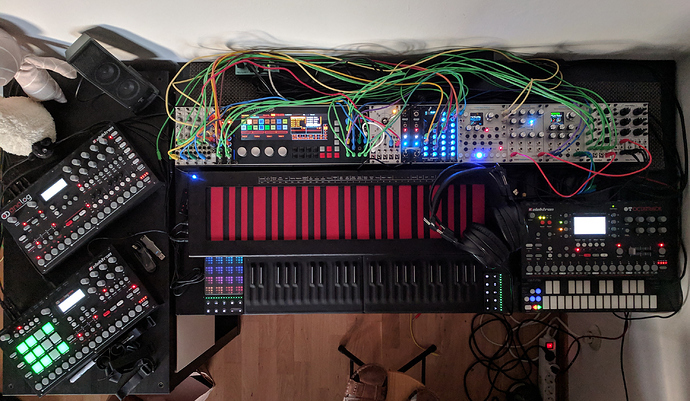 For anyone interested, the roli blocks are plugged in via midi bud (midi over bluetooth) to the SSP, and the Continuum is plugged into the FH-2. The inverse is also possible. the A4 and Rtym are all fed into the Octatrack. Midi from the Qu-nexus is fed into the octatrack which is then passing it on to the Rtym and A4. 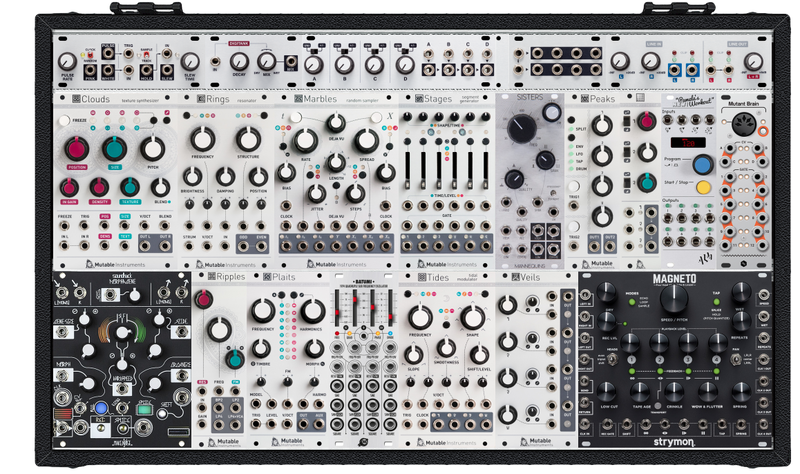 The Continuum is plugged into the SSP, and becomes part of the modular’s sound, which is then fed into the octatrack. I’m thinking of switching that up and having the Octatrack run into the SSP, and then the final out be the modular. I finally took the time last night to rebuild my case using the rail brackets I got. The added width means the case is even uglier than it was before, but the modules all fit properly now. And having the 1u row in the middle is SO much better than at the top. All the knobs and sliders on that top row will finally be unobstructed! So great to see everyone’s setups here! I’m guessing I’m at that point of Eurorack expansion that happens after a year or so, before paring everything down to the beautiful, minimal pods I’m seeing in this thread? 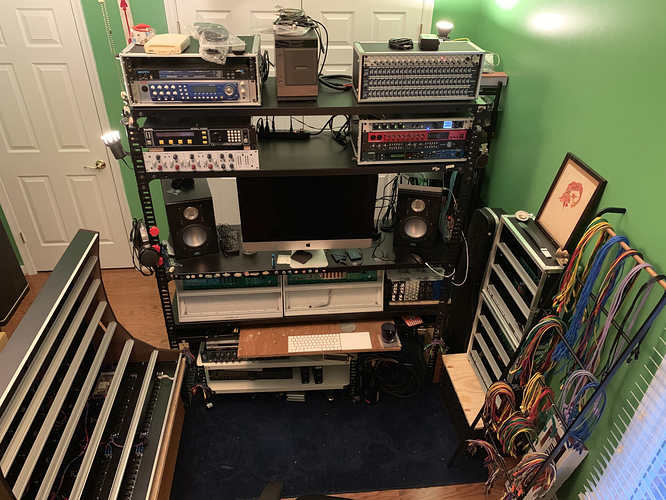 Here’s where I’m at for now, I went from a Pittsburgh 208 to a 360 to accommodate a mixer, I really wanted to have this instrument be self-contained. Recently added a popcorn which I’m loving, plus an Erbe-verb which I can’t believe I’ve done without for so long. 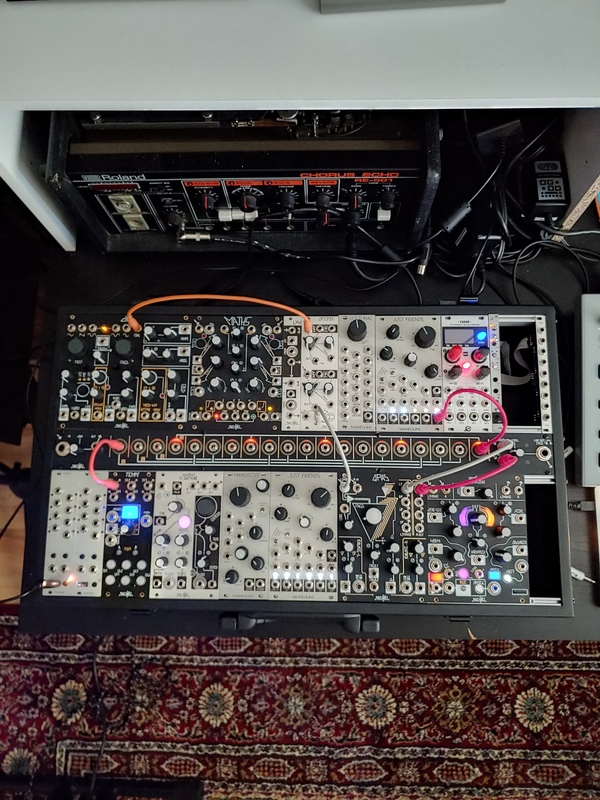 FYI I funded my Eurorack by liquidating a bunch of recording studio gear I wasn’t using. I also sold a very nice guitar to fund my Buchla 208r last November. Hope to someday get a cheap 218 and build out a little Easel setup.